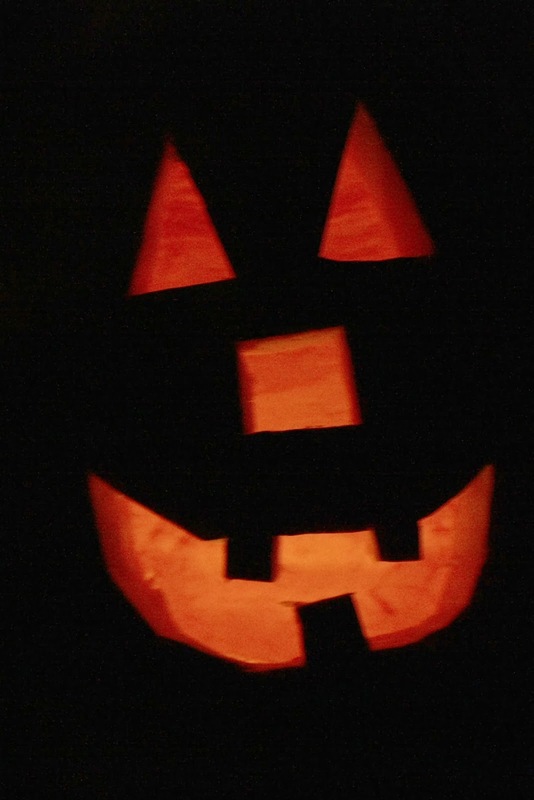 This post has nothing to do with a pumpkin, but everything to do with a frightfully funny story that occurred this week. . . So Hubby was out of town earlier this week. The first night he was gone, as I was going to bed, I realized my cell phone needed to be charged. I charged it in the kitchen and I was heading back to our room, I thought, hmmm, maybe I'll just bring our home phone back with me (because we are one of those rare families who still have a landline), you know, just in case. Well, around 1am, I was jolted from my sleep with a BANG BANG, bangbangbangbangbang. It was a knocking, but the loudest, scariest, most desperate and possibly I'm-going-to-break-your-door-in bang, I've ever heard. I was terrified!! I sat up, unsure of what to do. I'm certainly not one of those crazy people in horror movies who actually go searching for the noises they hear. No. Me? I'm paralyzed!! And then, I heard it again. Soooo, I placed my first-ever 911 call. The lady was nice and urgent sounding, thankfully. I told her I needed the police and she was asking me something when I heard the banging again and frantically told her so. She of course needed my address (duh) and told me the officers would arrive soon. We conversed a little--about how I was home alone with my 4 small boys, and how I thought maybe someone needed help, though I really thought someone was coming to murder us. She quickly told me that being home alone and it being 1 in the morning was no reason for me to go to the door. I was appreciative! Super quickly, the lady (wish I knew her name) told me the officers were at my door and they wanted me to answer it. I went, but only because the lady stayed on the phone with me! I'm a tough cookie. As I walked down the hall, I heard Luke and Charlie's voices, no doubt the banging woke them up too! I greeted the officers and asked them to check the back. As they were talking to me, 2 more squad cars zoomed up, making it a total of 4 cars in front of our house. Thankfully, no lights or sirens were blaring--I made sure to request that with the lady on the phone. That would have scared me even more--if possible. As the officers were walking around to the back, I told them I needed to check on my boys, who sounded awake. I opened the boys room and Luke greeted me with. . . "Mommy!! It's about time you came! I had a really bad dream and I've been banging on the wall so long for you to come!" Yep. The most terrifying banging I've ever heard was from my sweet boy who had a bad dream! I immediately went from thankful beyond belief to mortified. After quickly assuring Luke that he was okay, and that next time he should call me or come to my room, I made my walk of shame. "Officers, this has never happened before and I'm SOOO sorry, but my little boy had a bad dream and was banging on the wall." To which they replied, "Ma'am, it's okay. That's what we are here for. You have a good night!" And they drove off into the night, my heroes. I went back to sleep, though a while after, since my heart rate was still quite elevated, with a smile on my face, so thankful for those officers, and so thankful there wasn't a real emergency, (but still a little worried if something really did happen again, they would think I was crying wolf)! A story for this record book! Oh my goodness!!!! Hahaha! That is soooo what would have done! Bless your heart! Glad it wasn't a real emergency. What a funny memory for you! I would have felt the same way... I'm sure it is funny now - but not at that moment. Have a great weekend!